It’s almost time to close the books on 2017. Before we get to the last page however, let’s take a quick look back at some of the subjects that shaped the last 365 days in the Printerverse, and what we can learn from them moving forward. The U.S. Presidential Election. This isn’t about him, this is about us and how we as individuals, community members and professional colleagues handled the way we shared thoughts about it. Wasn’t so great. This post addresses it. The takeaway here is passion can flip quickly to debate, which can flip quickly to argument, which can flip quickly to battle – especially though social media. Think long and hard before you use your professional channels for personal reasons. Print Customers. This year I embarked on a journey with Canon Solutions America, Domtar, Scodix, Trekk and Miralupa landing #ProjectPeacock in the conference rooms of some the biggest ad agencies and brands in the world. This high-level digital print show-and-tell, seen by over 300 print buyers and creatives in 2017 taught us one gigantic lesson: the print industry is really good at talking to itself, print customers… not so much. And this isn’t a debate, it’s a fact. #ProjectPeacock will be rolling into LA, Austin, Seattle and San Diego in 2018. I will share feedback from our 2017 visits in my next post to help you make a plan and get “relationships” back into your business. Print Shows. I was lucky enough to attend many of them in 2017. I learned a lot at every show, I met amazing people and experienced a taste of the global print community along the way. The Printerverse at Print 17 was the second most visited booth at the show thanks to the open knowledge sharing and support of these 28 companies. I also saw some major WTF along the way… Students sharing #MeToo stories from events will be the end of us. As suppliers tighten their marketing budgets and evaluate which shows work the best for them, some of that assessment is based on you, the attendees. If you want to see companies at shows then SUPPORT THE SHOWS!! Go if you can. If you can’t, watch the live coverage and follow the event streams. Support by sharing information relevant for your business and audience. Network and connect with exhibitors and others in the event streams. I cannot disagree that we need more “new” at events and perhaps even less events, but I cannot agree that we don’t need shows. Whether they live or die is always up to the people… aka YOU. Taking Charge. 2017 saw a shift of power. Those who have it now are the ones who invested in information. It’s not your press, it’s what you can do with it. It’s not the print files, it’s how you manage the output across devices and locations. It’s not your pricing, it’s about increasing margins through efficiencies and having more wiggle room. It’s not about complacency, it’s forging your way through the communications jungle, and gathering up knowledge by any means necessary. There are 3 words that can transform you from a hero to a zero as soon as they leave your lips… “I don’t know.” That used to be an endearing phrase… people “man” enough to admit they didn’t know everything. Now it’s a death sentence. If you don’t know, I am betting I can find a line of others who do, who can, and who will take my business from you. I am leaving this very broad. You know what you don’t know, and what your competition does. Fix that. 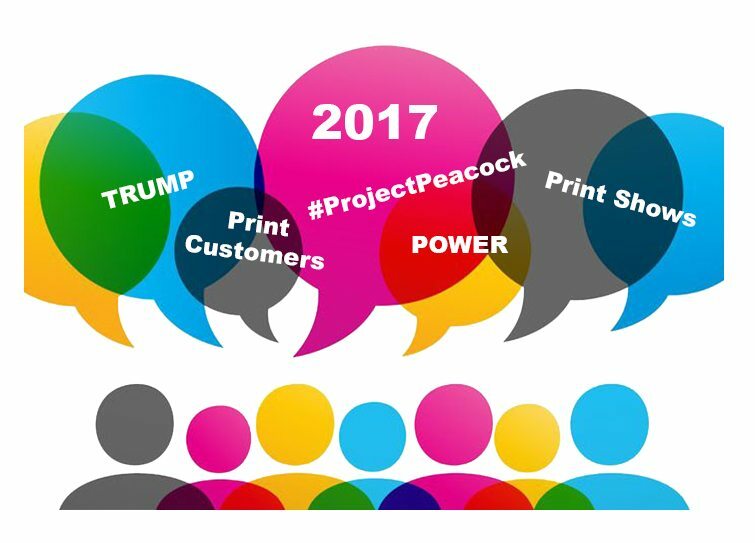 At #PrintChat last week my first question was “Overall on a scale of 1 to 5 (1 highest), how would you rate 2017 and why?” Of the 100 or so people who responded at the chat and through other social channels, almost everyone said 4 or 5, and cited 2017 as one of their best years ever. Thinning out the herd has made those with real, value-added, money-making, business-growing, ROI-producing products and services easier to find, and do business with. Hope to SEE you in 2018… Print Long and Prosper! Deborah Corn is the Intergalactic Ambassador to The Printerverse at PrintMediaCentr, a Print Buyerologist™, Integrated Marketer, Industry Speaker and Blogger, Cultivator of the Print Production Professionals Group, the #1 Print Group on LinkedIn, and host of #PrintChat, a weekly industry gathering on Twitter every Wednesday at 4PM ET. She has 25+ years experience working in advertising as a Print Producer, and currently works behind the scenes with printers, suppliers and industry organizations helping them to achieve success with their social media marketing endeavors, and create meaningful relationships. YOU ARE THE BEST FOILICIA!! !